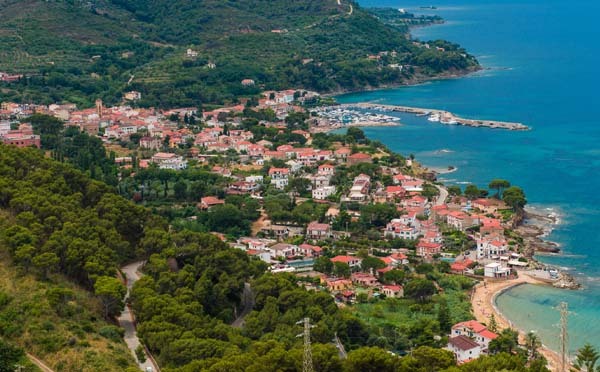 San Marco di Castellabate is, in our opinion, one of the most beautiful fishing villages on the Cilento coast. 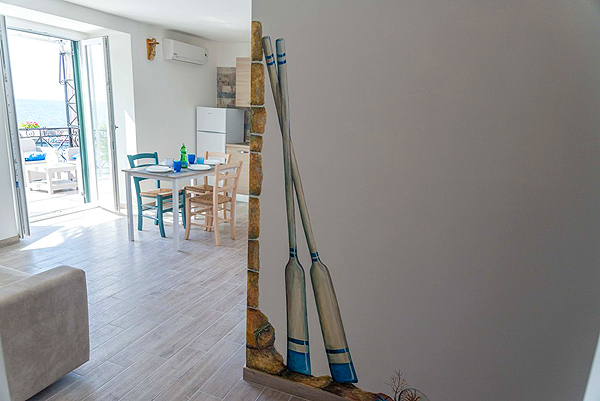 In the immediate vicinity of the harbor lies holiday apartment Casa Granchio, the perfect holiday refuge for two. 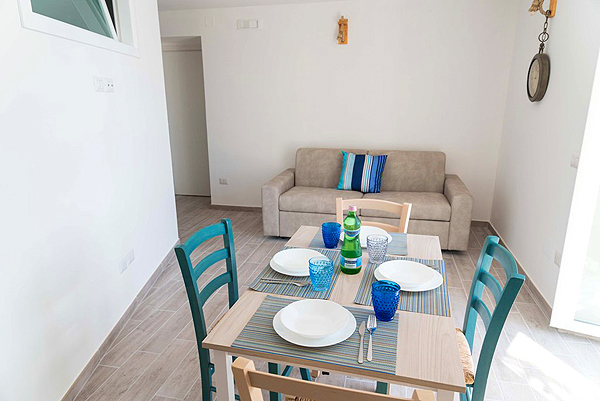 The small apartment in a palazzo right at the seaside was completely renovated not too long ago, in 2017. 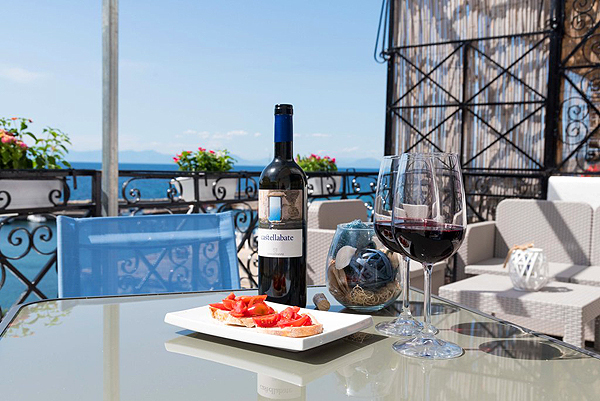 From its large, sunny terrace with cozy seating corner you have got a captivating view. 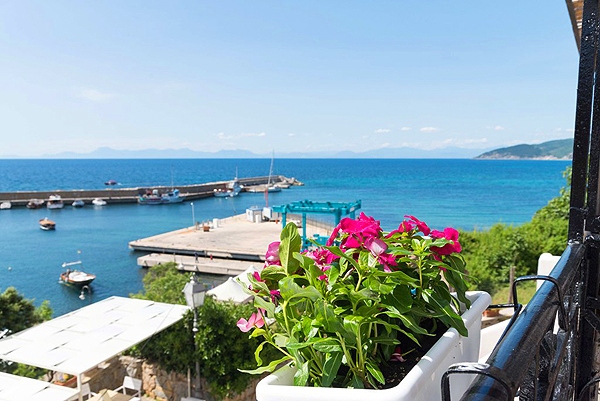 The harbor with many colorful fishing boats, a restaurant and a cozy bar lies right in front of the house door. The Amalfi Coast stretches out on the horizon. And, in between there is only the seemingly endless, deep blue sea. 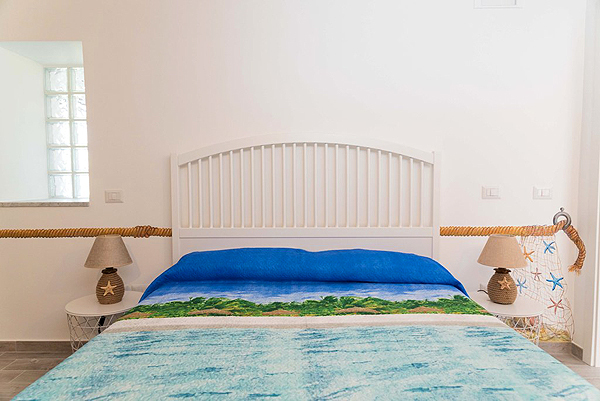 In this place, Southern Italy is simply what it is – a beauty full of joie de vivre and color. Casa Granchio is a suitable accommodation for those who wish to leave their car parked once in a while and to be within walking distance of the beach, stores & co. 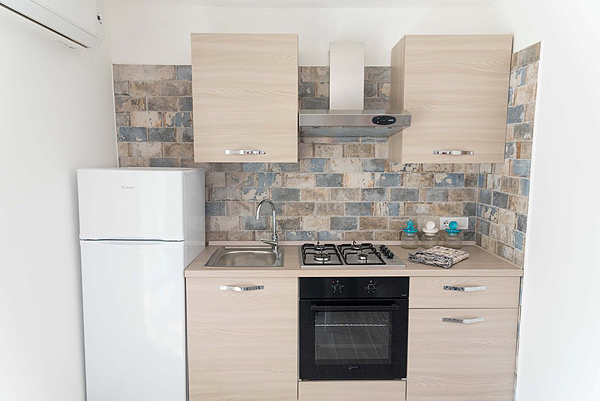 The lovely apartment includes a live-and-eat-in kitchen with access of the terrace, a double bedroom and a bathroom. The bright live-and-eat-in kitchen is furnished with a small kitchenette with gas stove, oven and refrigerator with freezer compartment, a sofa and dining furniture for 4 persons. It has got air conditioning and opens onto the large sea view terrace. 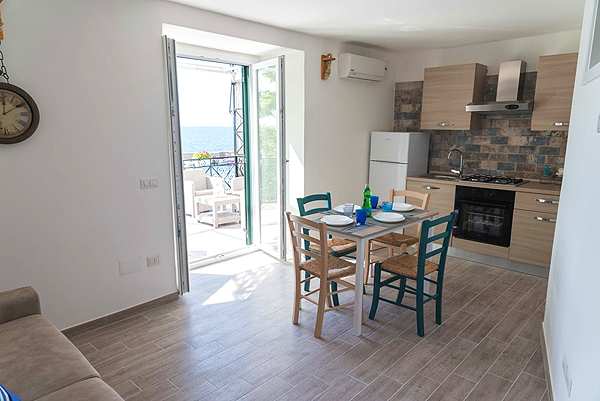 Behind the live-and-eat-in kitchen lies the cozy, maritime-style bedroom with double bed, wardrobe and a window, which opens towards the live-and-eat-in kitchen. 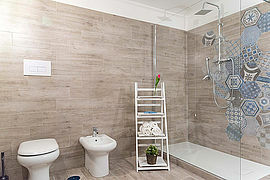 The bathroom next to the bedroom is furnished with WC and bidet as well as a large, curbless shower cabin. 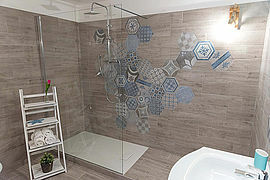 Further amenities found at Casa Granchio are free WLAN, washing machine and TV. There is hardly any doubt about the fact that Southern Italy is best enjoyed out in the open. 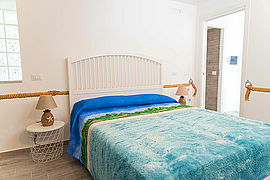 At Casa Granchio, you can do so on the large terrace, from where you have got a direct view of the sea, the harbor of San Marco di Castellabate and, on clear days, the Amalfi Coast. 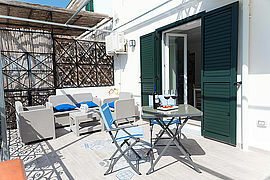 The terrace is surely the heart of the apartment, which offers comfort not only inside but also in the outdoor area. Furnishing of the terrace includes a small table with chairs, so enjoy your meals out in the open. Relax in the cozy seating corner with sofa and two chairs and let the day fade away while savoring a glass of wine. The terrace is shaded by a pergola. Should you arrive by private or rental car, a reserved parking space is available for you in a side road not far from the holiday apartment (ca. 150 m). A car is of course recommended if you plan to go on excursions into the farther surroundings. Busses run at regular cycles between the towns of San Marco, Santa Maria di Castellabate and Castellabate. Bikes or e-bikes are also a convenient means to get around and explore the nearer surroundings. A bike rental, Antares 91, is found in the center of Santa Maria di Castellabate. Moreover, from April to September, shared transfer service is available from Naples airport and station for a reasonable price (see below). Although it is small and therefore easy to take in, San Marco offers whatever you might need during your holidays. Restaurant Quasi in Porto and a bar, which also serves various small meals, are right in front of your house door. 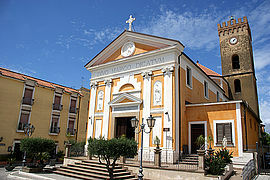 At the church square about 250 m from the holiday apartment you find more restaurants, a kiosk and small stores along Corso De Angelis. A grocery store is found about 300 m from Casa Granchio. Furthermore, Thalasso Spa is located right at the harbor. 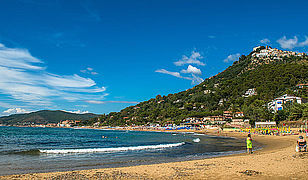 The town is flanked by two idyllic sandy bays, which are a short, ca. 50 m walk off. 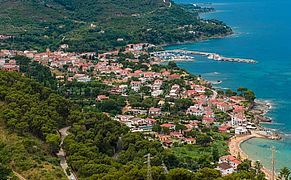 Those who prefer long sandy beaches need only follow the coastal walk to neighboring Santa Maria di Castellabate and its fine, wide beach. Appealing and cozy – your outdoor living room. 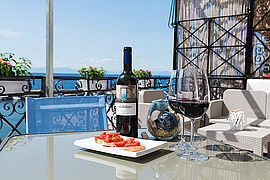 On clear days, you can even see the Amalfi Coast from the terrace. The maritime-style bedroom with double bed. 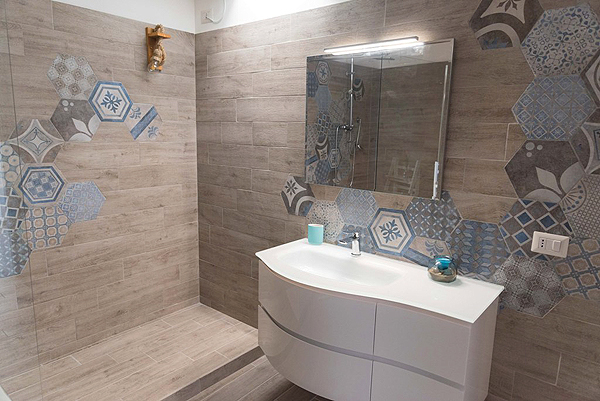 Glance into the holiday apartment's modern and elegant bathroom. Glance from the entrance area of Casa Granchio into the live-and-eat-in kitchen. 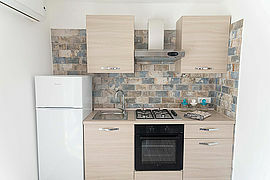 ...as well as a small kitchenette. 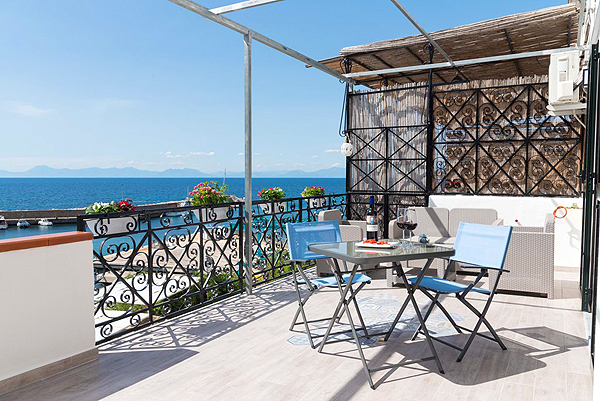 Enjoy Southern Italy to the full on your beautiful terrace. Glance into the bedroom of Casa Granchio. 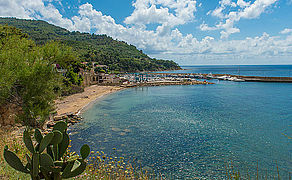 The fishing village of San Marco di Castellabate is idyllically located on the border of nature reserve Punta Licosa. 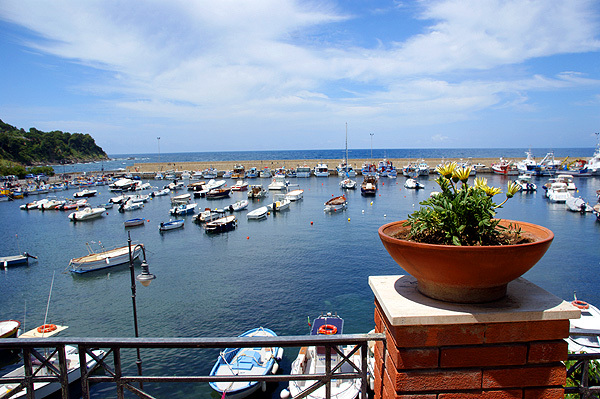 Only a few steps from Casa Granchio – the picturesque harbor of San Marco di Castellabate. Around the church square you find restaurants and small stores. 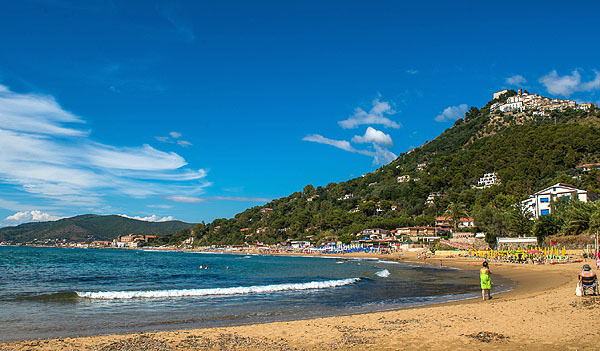 The Cilento can, without doubt, be called a bathing paradise. Use of air conditioning is optional and charged on the spot according to use. Deposit: 100 Euro (due in cash upon arrival).